The Stock Replacement strategy is often taught as the first options trade for stock traders who've expanded their trading to include Options. This Special Report is aimed at newer options traders and meant to be a primer/reminder for the consideration about dividends that need to be monitored when employing the stock replacement strategy. Specifically, knowing the ex-dividend date for stocks in which they have used an "in the money call" to “replace” long share exposure in a stock. The stock replacement strategy has many benefits and risks to those who use this strategy. The long call is hedged bullish exposure to stock appreciation, but given that the strategy employs leverage, meaning the owner can lose 100% of the purchase price, that amount is typically a fraction of the price of an outright stock purchase. The strategy has upside with an increase in the stock’s share price as a long holder of stock does. This strategy is typically established using 70 delta in the money options, to give the call holder a dynamic 70% risk of stock ownership initially. A fundamental difference between options and stock, is that stock shareholders have rights to dividends while long option holders do not receive dividends. That makes it critical to monitor if, and more importantly, how much and when the stock trades ex-dividend. Pay attention to that last part: the stock trades without rights to any new owners after the ex-div date. Meaning the stock will trade (lower) without rights to the dividend on the ex-dividend date. Therefore, if you are holding an ITM call option on a stock which trades ex-dividend tomorrow you must make a choice before the end of option trading today. If the ex-dividend amount is greater than the value of continuing to hold the call, it may cost you money to continue to hold that ITM option rather than sell or exercise it relative to owning the stock. ﻿If you own the ITM February 35 calls in MSFT, you likely have a nice gain with the recent rally in the shares, congratulations to you! However, do not give away money by ignoring the economic facts that owning the stock is worth more (28 cents) than the extra value that being long the option contract. We expect the stock to trade lower by 28 cents on the morning of the ex-dividend date and the call option will fall in lock step. You need to choose to either exercise this option, turning the position into long stock which will receive the dividend payment offsetting the fall in the stock price, or sell this option in order to not lose the dividend amount of 28 cents per share. Whichever action you choose, you have to take that action at least 1 day prior to the ex-div date or, in this example, Feb. 17, 2014. But what if you still like the prospects for MSFT stock and expect the stock to trade higher? Exercising the stock would obviously allow you to profit with further increases in share price, alternatively if you desire to continue to have bullish exposure through Stock Replacement Call ownership, simply sell this February 35 call and “roll” it to a new expiration which the option has more extrinsic value (look at the put option with the same strike) than the upcoming dividend. Like the March 36 calls, for instance which have a delta of 77 and are trading above parity, and the corresponding puts show a market of extrinsic value of 46 cents. This new long call will still give a limited risk long exposure to further stock appreciation. The risk is that the calls would expire worthless, and the loss would be the price paid for the options. 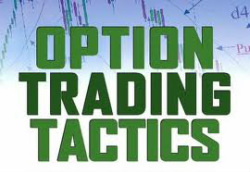 For a full understanding on this Stock Replacement strategy view the presentation by Steve Claussen Options 101 Long Calls. You can also review ﻿Stock Options Explained﻿ in ﻿Lesson 3 -﻿ Understanding The Markets. 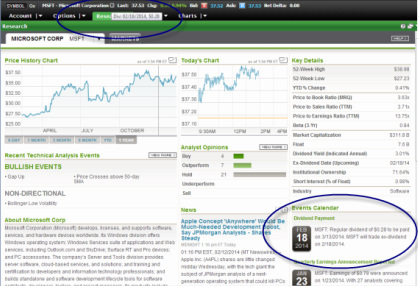 It is a good routine to add to your daily market monitoring to check an ex-dividend calendar. While we post a div icon on the platform with ex-div dates within 30 days, it is important to realize these are estimates and should be verified. The folks at Benzinga have a good event calendar wh﻿ich you can select a specific upcoming day and see which stocks will trade ex-dividend on that day. It may also be a good idea to start your trading day on the Premarket Show we are sponsoring with Benzinga. Don’t allow a stock trading ex-dividend to cost you money. Remember you have to act the day before the ex-div date. 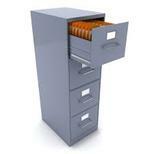 For more information from the SEC about stock dividend entitlements click the below link. “Ex-Dividend Dates: When Are You Entitled to Stock and Cash Dividends”. Securities and Exchange Commission. Retrieved 6 December 2011.